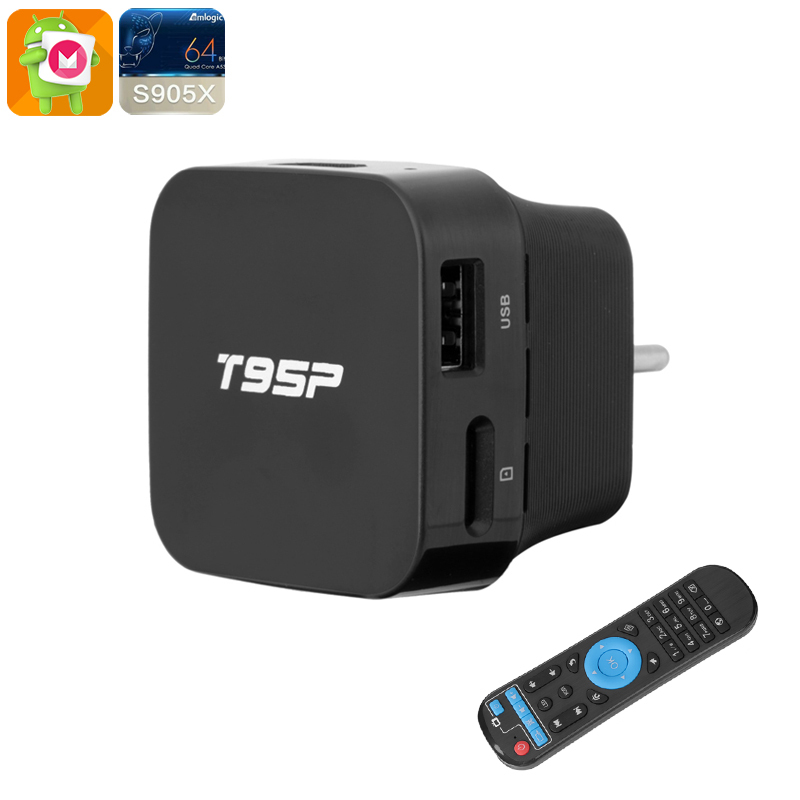 Successfully Added Sunvell T95P Android TV Box - 4K Movie Support, Quad-Core CPU, 2GB RAM, 32GB External Memory, Google Play, Kodi TV, Wi-Fi to your Shopping Cart. The Sunvell T95P is a remarkably small and compact 4K TV box that comes packed with countless hours of fun and entertainment. Supporting 4K video, this smart home accessory allows you to turn your living room into your own private cinema – letting you enjoy the latest movies and series in absolutely stunning ultra-HD resolution. Its unique plug and play design let you simply plug it into your power port and you’ll be all set to enjoy your favorite movies, games, and TV applications straight from your big screen TV. Perfect for any modern household and office out there, this Android TV box is guaranteed to fill your life with an unlimited amount of entertainment – assuring that you’ll never have to be bored again. Thanks to its Android 5.1 operating system, the Sunvell T95P is guaranteed to deliver a smooth performance that lets you enjoy all this 4K TV box has to offer to the absolute most. Whether you like to watch a movie, play a game, or simply browse the web – this Android TV box will not like you down. Supporting both Google Play and Kodi TV, the Sunvell T95P literally provides you with access to millions of the latest TV applications, games, and movies - assuring that from now on not a single moment of boredom will ever enter your house again. With its 4K resolution, this Android TV box provides absolutely stunning visuals filled with extremely high detail and vivid color, letting you enjoy all media in a way never experience before. With its 8GB of internal memory and 32GB external memory support, you no longer have to worry about running out of storage as there will be plenty of space for all your games, movies, and all other files imaginable. Featuring a Quad-Core CPU that has been clocked at 1.5GHz, the Sunvell T95P is capable of handling the latest and most demanding mobile games and applications alike without dropping a frame. Added to its CPU comes 2GB of RAM that supports demanding multitasking sessions – letting you enjoy multiple of its features simultaneously without needing to worry about slowing down your device. 4K movie support means that you’ll be able to undergo a truly cinematic experience right from the comfort of your own living room. To enhance your media experience even further, this 4K TV box features the Mali-450MP graphics unit. This GPU lets you enjoy stunning graphics and vivid color – providing you with an unbelievable media experience. Whether you wish to enjoy a relaxing movie night at home with your wife and children, or invite over all your best friends and engage in a night filled with games, movies, and entertainment – the Sunvell T95P Android TV box is guaranteed to meet all your media demands. The Sunvell T95P Android TV box comes with a 12 months warranty, brought to you by the leader in electronic devices as well as wholesale electronic gadgets..